Mellow, high-pitched “hoo-hoo, hoo-hoo-hoo,” often given in chorus by flocks in flight. Description: Sexes similar. 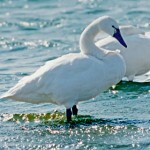 Adults white with long, rather straight neck; black bill with small yellow spot in front of eye. 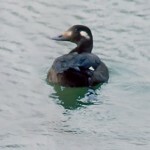 Immatures have very pale gray plumage, and pink bill with black tip. Habitat: Shallow lakes, marshes and adjacent flooded fields. 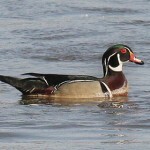 Where in Nebraska: A regular spring and fall migrant across the state and an uncommon winter visitor. Nebraska Seasons: Best times to view in Nebraka are March and November. Field Notes: Nests on tundra. 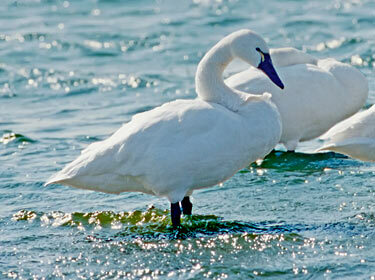 Additional Information: Often mistaken for the Trumpeter Swan.